Dr. Knapp graduated from Moses Lake High School in 1982. 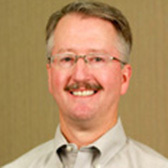 He spent one year at Big Bend Community College before transferring to the University of Washington, graduating from their dental program in 1990. After graduation, Dr. Knapp returned to his home town to begin his dental career, providing generations of smiles to the Moses Lake community. Away from the office, Dr. Knapp is involved with the Boys & Girls Club and the Rotary Club. He also enjoys hunting, fishing, golfing, and playing on the lake with his wife, Julie, and two sons, Tyler and Nolan, and daughter, Clara.